of the landmass of Seychelles, but has no human population other than the staff of the Research Station It is a tropical island wilderness, seen by only a few privileged visitors each year. Aldabra Expeditions will allow you to be one of these lucky few, taking you to the Research Station, the mangrove forests and the booby colony and giving you the chance to dive and snorkel the Main Channel, the West Channels and the Johnny Channel. 7th Century: Arabs settle in East Africa. The name Aldabra is of Arabic origin, but the date it was first visited is unknown. 1511: Portuguese chart shows islands north of Madagascar. 1742: Frenchman Lazare Picault visits Aldabra. 1812: Seychelles comes under British authority. 1874: Darwin and other eminent scientists urge the colonial government to protect Aldabra giant tortoise population. 1878: Captain Wharton visits and despite searches, finds only one tortoise. 1891: The lessee of Aldabra announces his intention to take 12,000 turtles p.a. 1892: William Abbott visits Aldabra and records many new species of birds. 1929: Reported that birds were being destroyed and might soon be extinct. 1954: Commander Jacques-Yves Cousteau highlights importance of Aldabra. 1965: Aldabra is detached from Seychelles to form part of the new British Indian Ocean Territory (BIOT). 1966: Detailed field survey for military base; beginning of public outcry following scientific reports. 1967: Plans for the military base abandoned; long-term research programme initiated by the Royal Society. 1971: Royal Society Research Station opens on Aldabra. 1976: Aldabra detached from BIOT, returned to Seychelles and becomes a Strict Nature Reserve. 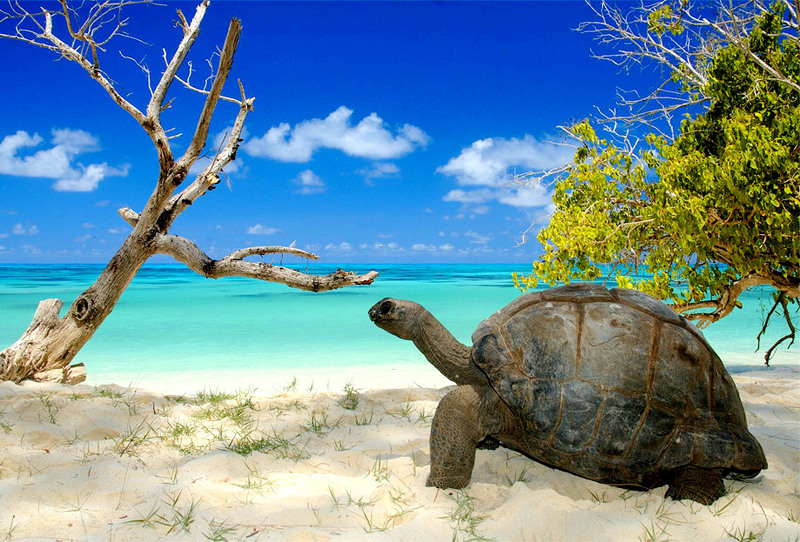 1979: Seychelles Islands Foundation is established by Presidential decree to manage Aldabra. 1982: Seychelles Government gifts Aldabra as a UNESCO World Heritage Site. When humans first settled Seychelles in 1770, giant tortoises inhabited most of the islands. But they were intensely exploited for food, and by the middle of the 19th century, were extinct except for those on Aldabra. Even the Aldabra populations reached dangerously low levels. Fortunately, protective measures were implemented from the late 1800s. Numbers rose dramatically and a census in 1997 indicated a population of 100,000, by far the largest population of giant tortoises in the world, many times the size of the surviving natural population in the Galápagos. Like the tortoises, Aldabra sea turtles were badly persecuted by humans. Some estimates of green turtle numbers at Aldabra in the late 19th century were as high as 12,000 females nesting annually, but several thousand were killed each year mainly for export to Europe. In 1968, the Government banned the export of all green turtle products from Seychelles. As a result, numbers of nesting green turtles rose from less than 1,000 per annum in the late 1960s to more than 5,000 in recent years. Aldabra is biogeographically much more closely related to Madagascar than the rest of Seychelles. All the land birds have their nearest relatives in Madagascar, including the Aldabra Rail, the last surviving flightless bird of the Indian Ocean. Other endemic species we will encounter ashore are the Aldabra Drongo, Madagascar Coucal, Souimanga Sunbird and Aldabra Fody. Seabirds include 10,000 pairs of frigatebirds breeding in one of the world's largest colonies. Shorebirds include large numbers of crab plovers, a speciality of the western Indian Ocean. The vegetation is dense and shrubby, adapted to relatively low rainfall and strong winds, and dominated in large areas by pemphis. Around 15 percent of the land area is more open, and covered in low grasses known as "tortoise turf". Around 24 species of plants are taxa unique to Aldabra. Diving and snorkelling at Aldabra is outstanding. Counts of fish numbers at monitored sites off Aldabra have shown a density of around 3,000 individuals per 100 square metres, with hundreds of species represented. We focus on the sheltered northwestern side of the atoll where Aldabra’s coral cover is greatest and explore the steep-sided underwater canyons of the channels. Drift diving is exceptional in these channels that fill and empty the lagoon with the tides. Shoals of fish stand sentry at the entrances, where sharks and other predators sweep by as they commute between the open ocean and the lagoon. Within the lagoon mangroves create a vast and impenetrable forest. Down below, in the shelter of their roots, fish spawn and the young profit from the fertile environment created by bird droppings from the dense colonies of frigatebirds and boobies. In recent years, dugongs have been seen, and aerial surveys indicate this rare mammal may now breed in Seychelles after an absence of more than 200 years.